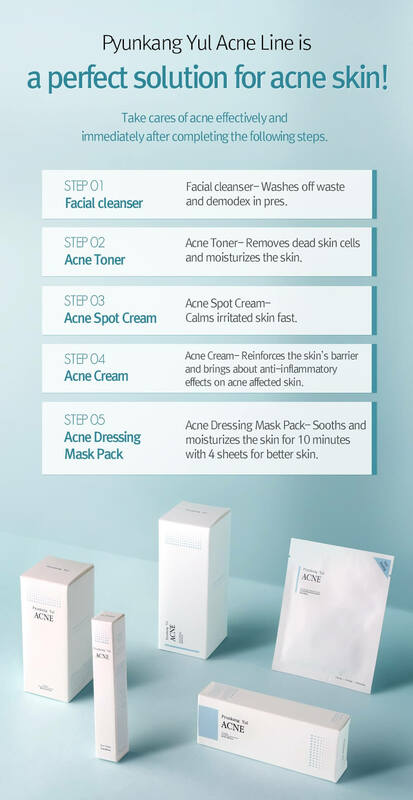 Pyunkang Yul Acne Line is created for specialised acne care. It inherited from Pyunkang Oriental medicine clinic's 40-year philosophy and know-how. The Acne Toner specifically targets acne with a thin texture and so is lightly absorbed into skin. All ingredients have an EWG rating of lower than 3, gently softens sensitive acne skin texture and relieves the skin remarkably. The Acne toner helps minimise pores and promotes skin regeneration whilst controlling skin sebum. The Pyunkang Yul toner also gently exfoliates old/dead skin cells away helping to unclog pores and thus reducing acne problems. Recommended for oily skin as the Acne toner is light with a watery consistency and has no essential oils that prevent acne breakouts for those sensitive to oil based products. TO USE: Soak the cotton pad with an adequate quantity of toner and wipe the face in the direction which softens skin texture. Or you can pour an adequate quantity of toner onto your hand and then apply it to the skin.